In the early 90's there was not a light weight quality option for trailer cabinets and Jim Greenheck knew he could build an aluminum cabinet for his own race trailer that would surpass anything else on the market. 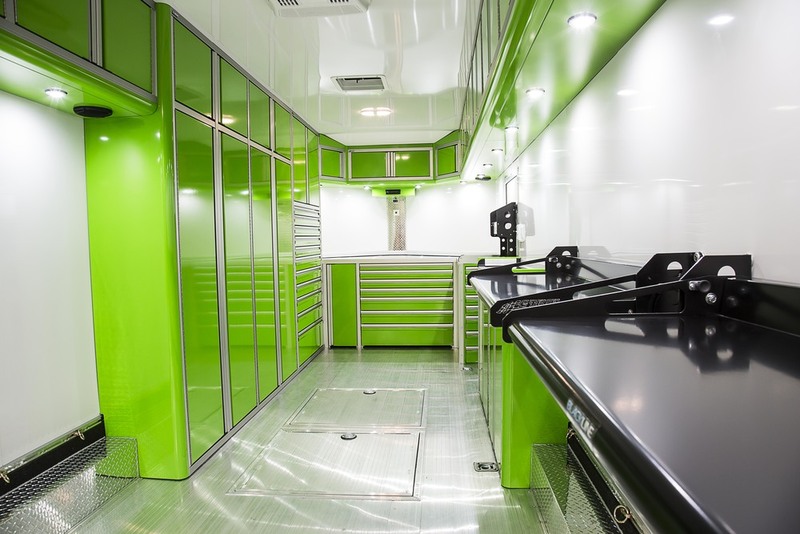 As a result CTECH Manufacturing was developed and quickly gained popularity and is now considered the most respected name in mobile aluminum cabinetry. 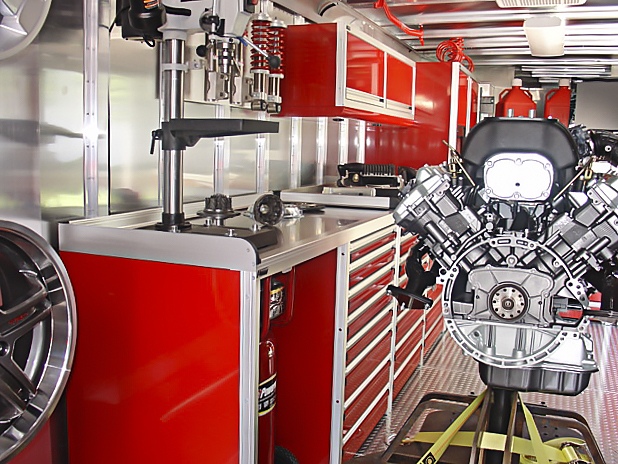 Over the years CTECH cabinets have been used in many applications including race trailers, mobile service, horse trailers, mobile command centers, military applications, food vendors, race shops, garages, office settings and residential kitchens to name a few. With the quality, powder coat finish and function of CTECH cabinets they are extremely versatile for any industry or application. Standard packages are available but our cabinets are parametric designed allowing adjustment in width and depth to fit your need. 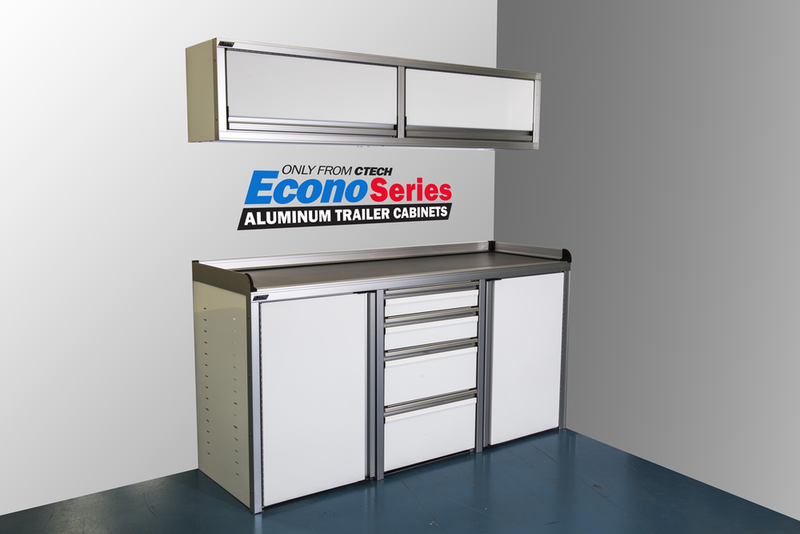 Aluminum Trailer and Garage Cabinets, get the same durable construction and all the features of CTECH's other cabinets at a fraction of the cost. Only available in pre-finished White. 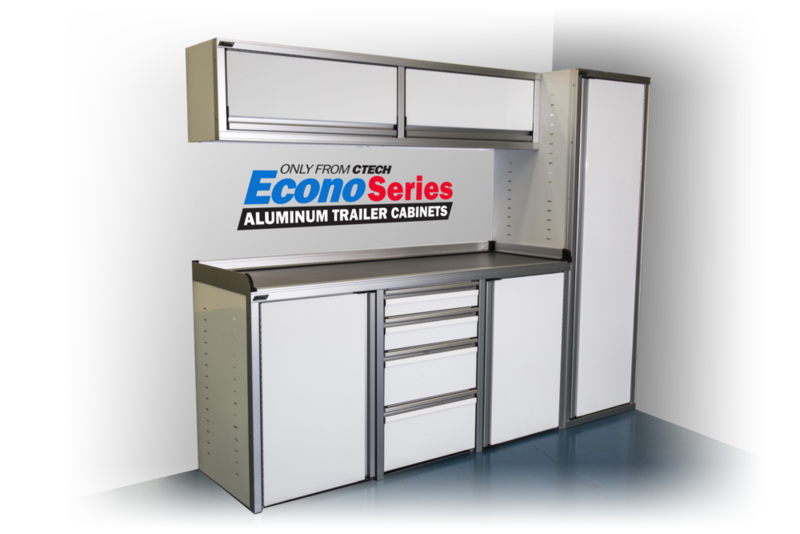 Designed and engineered for trailer applications these cabinets also fill the need for most when it comes to garage / shop storage. Available in 26 unique standard packages. When standard configurations don't fit the build CTECH's PREMIUM cabinets offer a full spectrum of options and custom configurations. Designed specifically for garage and shop settings, these packages include all the PREMIUM options into a standard pre-configured unit. 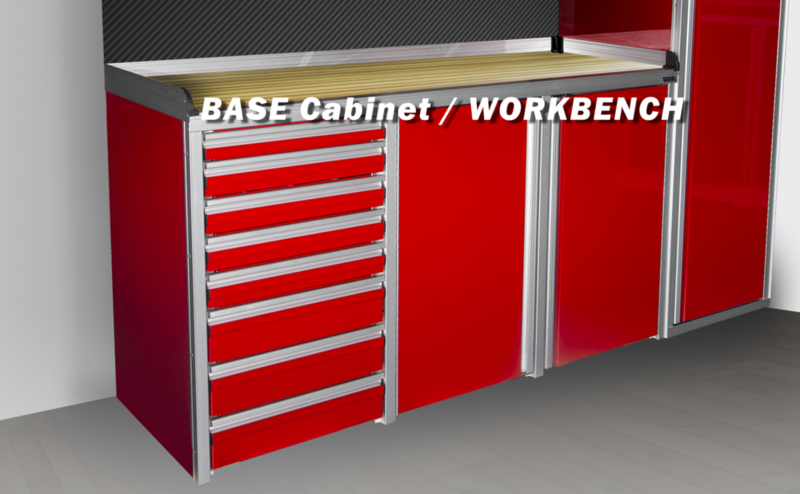 Purpose: Base cabinets offer the utility of a workbench with the convenience of under bench storage. 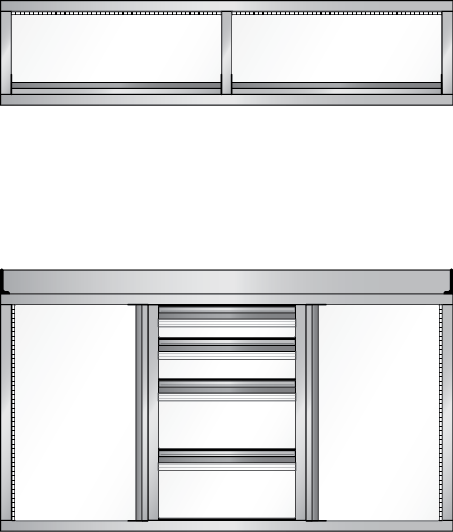 Application: At a height of 36” the counter-top is positioned at an optimal height for standing work. Which is an ideal fit for the nose of a trailer or an open wall. 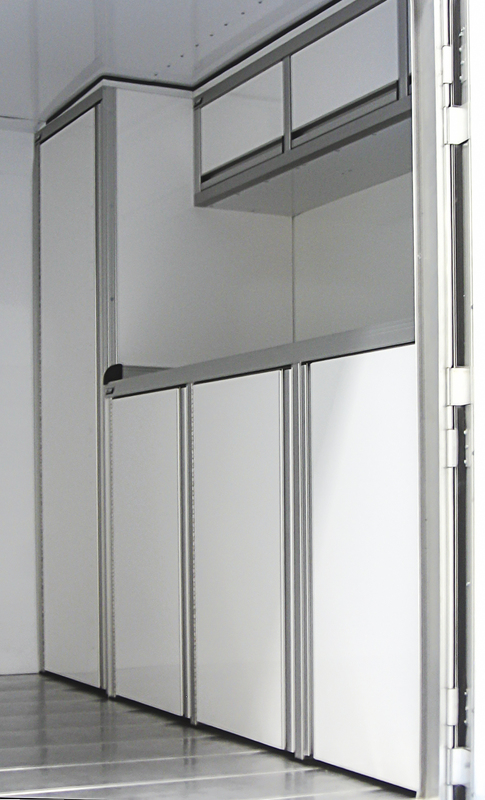 Purpose: Vertical storage of clothing from hanger bar or helmets, shoes and gloves with an Adjust-a-loc shelving. 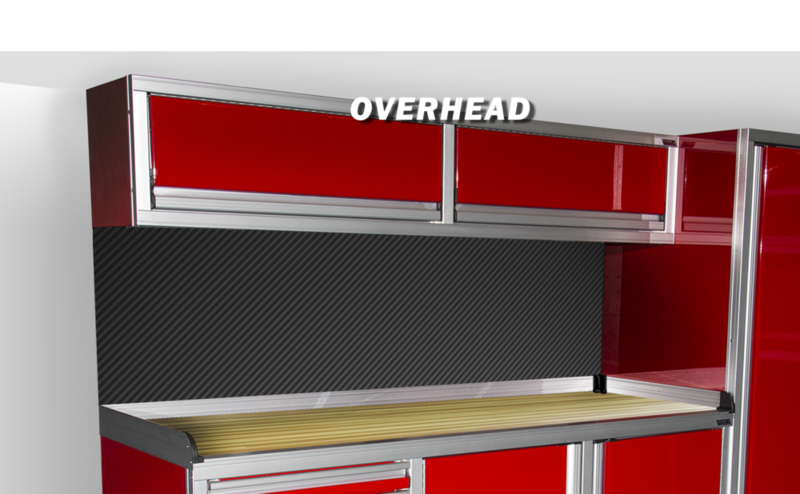 Purpose: Overhead cabinets are designed for storing small and medium items. Application: Ideally suited for mounting over base cabinets or along trailer walls. Individual units can be combined to create a longer unit. Upswing doors allow them to be up and out of the way when opened. Purpose: Wall cabinets are designed to convert unused trailer wall space into efficient storage. Application: Offering more storage then an overhead cabinet, the wall cabinet is generally used where ceiling height is not an issue and your quarters are not tight. 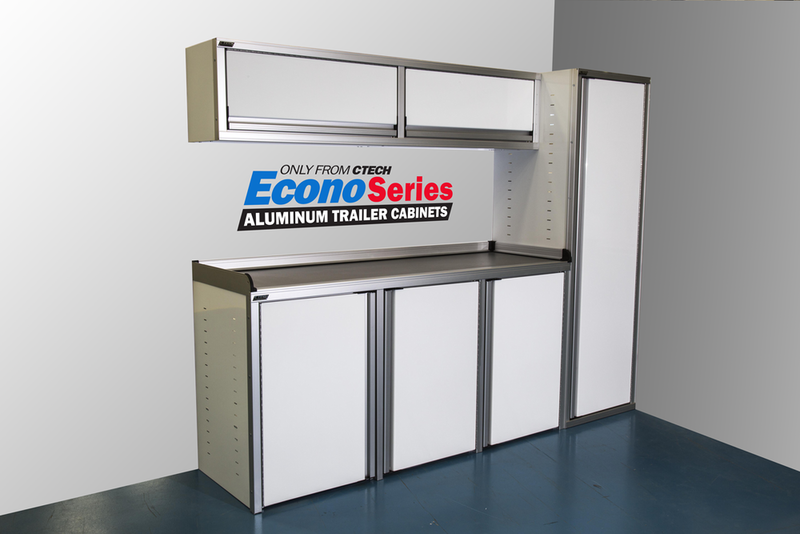 CTECH Manufacturing’s EconoSeries stands for superior quality for the budget minded. Do not be fooled by the name as CTECH has cut no corners in manufacturing or construction. 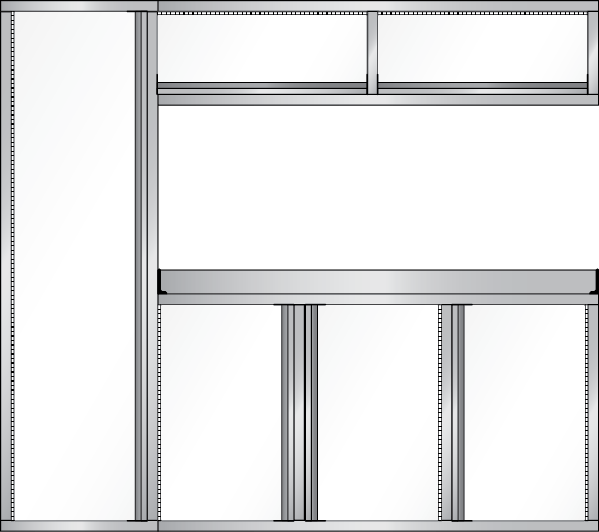 Using pre-finished aluminum for the body panels and an extruded aluminum frame for a quality product at a fraction of the cost. 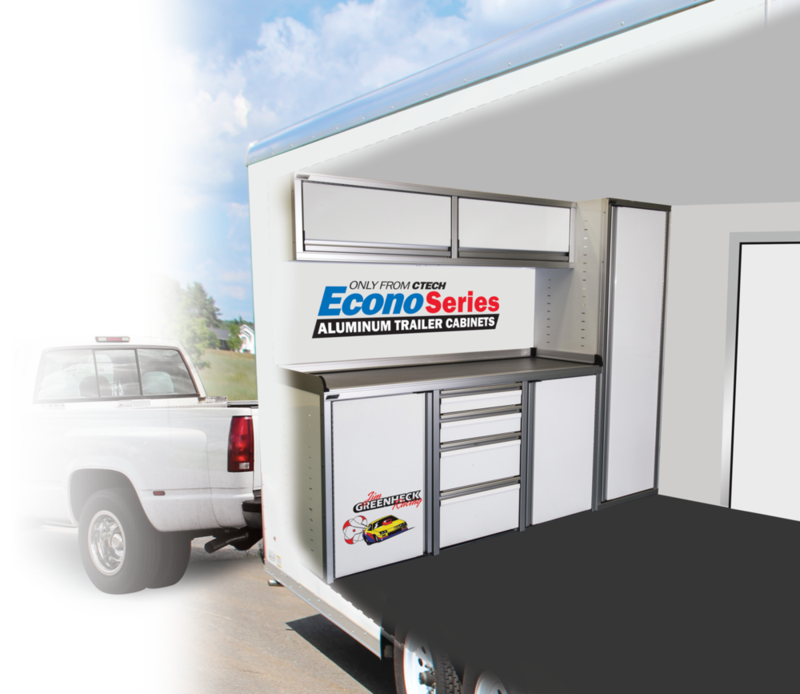 The Econo Series is offered in 4 standard packages configured to service most needs or individual modules in various sizes, CTECH has taken the guess work out of ordering. Designed to be purchased knocked down, assembled, or Dealer installed. 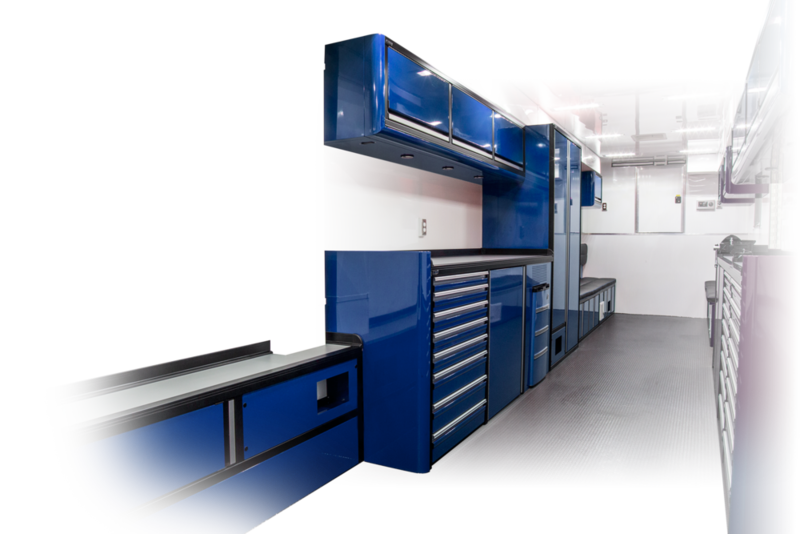 CTECH’s P Series cabinets offer the perfect storage solutions for Trailer, Garage and Shop applications. Giving the versatility of a workbench base unit with hassle free storage, CTECH's MotionLatch door and drawer handles allow for ONE HANDED OPENING MOTION no matter the situation. Available in a variety of standard configurations to meet most any need or MODULAR units to "custom" build your own package. 9 Standard powder coat colors allow for more customization to give a Premium fit and finish to any cabinet build. Not every application can be a standard unit nor do some people want a standard unit which is why CTECH offers our fully customizable Premium Series Cabinets. All of the structure and quality is the same throughout all of our cabinets but Radius panels, Vented doors, LED lighting are just a few options available in a Premium Series Cabinet. 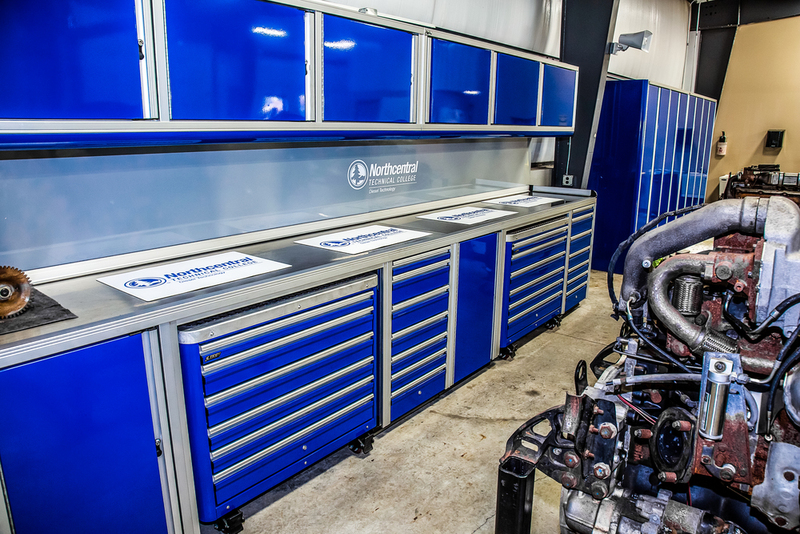 ULTRA Garage and Shop Cabinets are a part of the Premium Series designed into the most popular configurations throughout the Garage and Shop market. 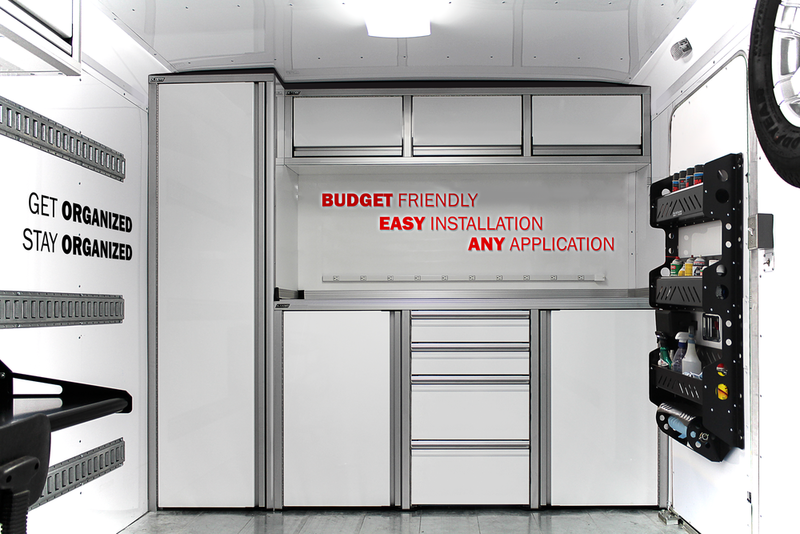 This allows you to purchase a fully customized shop cabinet as a standard unit, saving you time and money. Specialty Cabinets can vary widely on its interpretation. 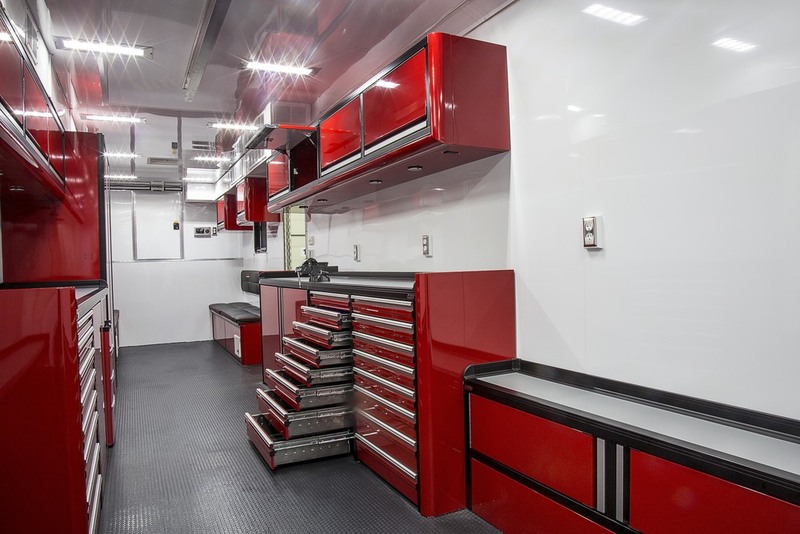 The capabilities of MOBILE ALUMINUM CABINETRY is very diverse which allows CTECH to offer storage solutions for many different industries and applications. Van packages can fit in any of the standard EURO style van including but not limited to Dodge Pro Master, Mercedes Sprinter, Ford Transit and Nissan NV series. 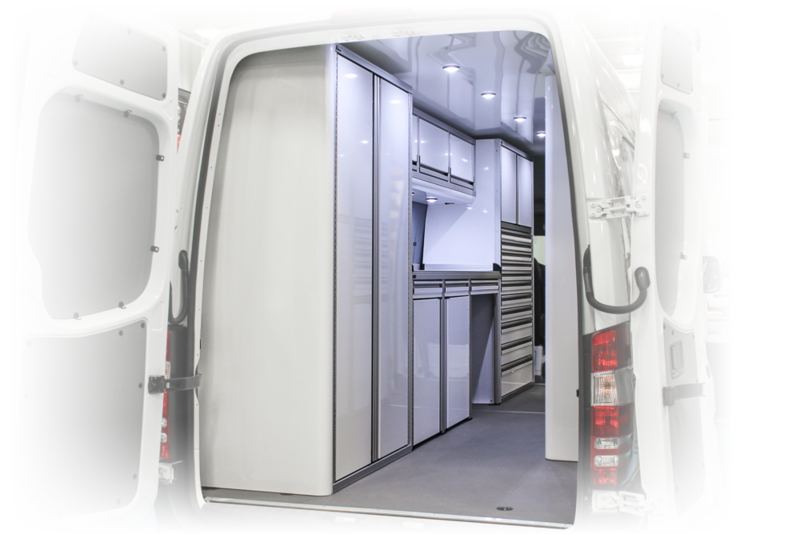 Standard box vans, delivery vans and ever specialty off road vans can and have been outfitted with CTECH cabinets. There are also lightweight mobile storage solutions for SUV cargo space and Truck beds. We have also provided cabinets for the US Military, Navy and Air Force.